2018 is going to be a very busy time for Dark Beauty, and the Dark Angel has come up with a way for you to get a preview of what’s coming up! 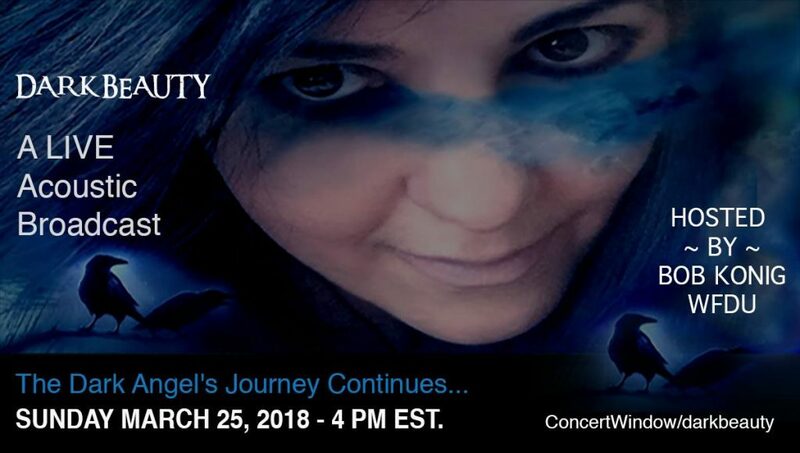 Dark Beauty will be releasing new music and performing at a progressive rock festival later this year, but on March 25 at 4 PM Eastern, you can enter the Dark Angel’s world for a live online performance! Join us as we continue the story of the Dark Angel’s journey. Bryan and Liz will perform acoustic selections from Fall From Grace as well as new songs from our upcoming second release and other musical surprises through ConcertWindow.com. We’ll also be telling some stories about the songs, and taking questions live. So mark your calendars and join us from the comfort of your own living room as we tell our musical story and continue building the Dark Angel’s world! Tell your friends, it’s FREE! and join us on March 25 at 4 PM Eastern at the link below. Feel free to visit anytime to see what the page looks like. Thanks for your continued support, and we look forward to seeing you on the 25th!